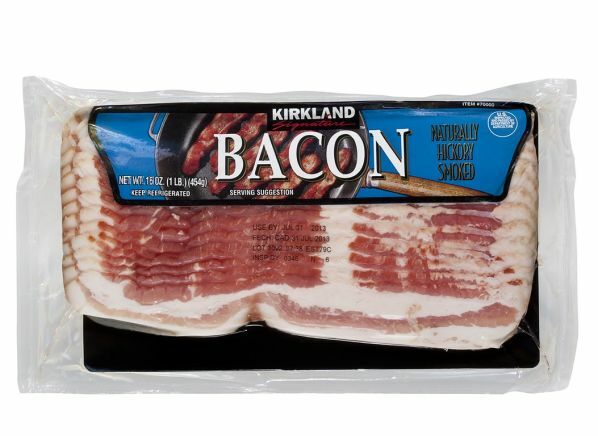 The Kirkland Signature (Costco) Regular Sliced is part of the Bacon test program at Consumer Reports. In our lab tests, Bacon models like the Regular Sliced are rated on multiple criteria, such as those listed below. Package size: The number of ounces in a package. Slices (per serving) Slices The number of slices per (approximately 1/2 ounce) serving. Cost ($) Cost Cost per serving (approximately 1/2 ounce). Information is calculated based on approximate retail price and manufacturer's servings per package. Calories Calories Calories per serving as listed on product label. Total fat (g) Total fat Total fat (g) per serving as listed on the product label. Saturated fat (g) Saturated fat Total saturated fat (g) per serving as listed on product label. Sodium (mg) Sodium Milligrams of sodium (mg) per serving as listed on the product label. Claims no antibiotics added Claims no antibiotics added Package claims no antibiotics added.